A total knee replacement is really a resurfacing of the joint with an artificial surface. The knee itself is not replaced, but the cartilage is substituted for on the end of the bones. This is done with a metal alloy on the femur, metal and plastic on the tibia, and a plastic kneecap (patella). This creates a new smooth functioning joint that does not hurt. 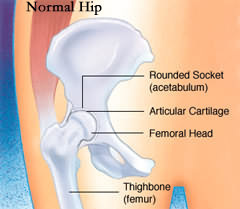 A total hip replacement is an operation that removes the ball of the upper thigh bone (femur) that is arthritic, as well as damaged cartilage from the hip socket. The ball is replaced with a metal ball that is fixed solidly inside the femur. The socket is replaced with a plastic or ceramic liner that is fixed inside a metal shell. This creates a new smooth-functioning joint that does not hurt. How long will my new knee or hip last? We expect most hips and knees to last more than 20 years. Long-term studies have shown that 90% of knee replacements and 85% of hip replacements are functioning well at 20 years. However, this is not a guarantee. A second replacement, or revision surgery, may then be necessary. Why do knee and hip replacements sometimes fail? The most common reason for failure for knee and hip replacements is wearing of the plastic liner, which creates debris particles that weakens the bone and leads to loosening of the components from the bone. Old components can be replaced with new ones. What are the results of total knee or hip replacements? Over 95% of patients achieve good to excellent results with relief of pain and significantly increased mobility and function. Is it possible it could be made worse? Yes, but this is uncommon. There are risks with any type of surgery, but they are far outweighed by the potential benefits. Potential complications, such as infection and blood clots, occur in less than 1% of patients. Most surgeries go well without any complications. Infection and blood clots are two complications that concern us the most. To avoid these complications we give antibiotics and blood thinners before and after the surgery. We also wear special enclosed suits in the operating room to reduce the risk of infection. Dr. Friedman will decide if you are a candidate for this surgery, based on your history, examination and x- rays. He will ask you to decide if your pain, stiffness and disability justify undergoing surgery. There is no harm in waiting if conservative, non-operative methods are controlling your pain. Successful knee and hip replacement surgery can allow patients to improve the quality of their life. Benefits of a new joint include reducing or eliminating pain, restoring lost range of motion, regaining the enjoyment and ability to perform normal daily activities, and improving the appearance of deformed joints. Recovery from surgery starts after your operation is over with physical therapy. Full recovery also depends on the patient following the doctor’s instructions after surgery. Once surgery time is reserved, the pre-operative process starts. Our office will work with you to make sure you have all the required tests, medical visits, and administrative work done. Patients are typically required to have lab work done as well as an EKG. These can be done in our office for your convenience. Patients are also required to visit with their medical doctor prior to surgery to ensure there are no other medical issues that may impede surgery or recovery after surgery. Some patients will require a visit to their cardiologist and we are more than happy to help facilitate that appointment. Additionally, some insurance companies require prior authorization of the surgical procedure. Our office will contact the insurance carrier and provide the needed information so that the surgery may be approved. Sometimes, the insurance carrier may require additional information from the patient before they will approve services. Should that be the case, the patient will be notified and asked to follow up with our office after they speak with their carrier. After surgery, physical therapy will begin to start strengthening muscles and increasing the range of motion of the replaced joint. Patients will be given pain medication for the discomfort following surgery. Patients are also given medication to prevent blood clots call deep vein thrombosis (DVT) in the veins of their legs. The anti-coagulant, or blood thinning medication will help to reduce the chances of blood clots. Elastic stockings are worn to help with the prevention of blood clots as well. Another reason physical therapy is important is that movement helps to decrease the chance of blood clots. Getting up and moving is one of the most effective ways to help with the prevention of the DVT. What should I expect after I leave the hospital? Typically, patients will be discharged home 3 days after surgery. Since physical therapy and exercise are key to recovery after joint replacement surgery, a home health therapist may be authorized by the patient’s insurance carrier to ensure that the needed exercises are being done correctly and as often as needed. The home health person will also check the surgical site and the operative leg for any signs of infection or blood clots (DVT). The patient should always call our office with any concerns they have and with any changes to the appearance of their legs or surgical site. Should there be any concerns, please be ready to let the office know how long the new or worsened condition has been going on, the pain level associated with the condition, any discoloration to the leg, and any increased or new swelling to the leg.